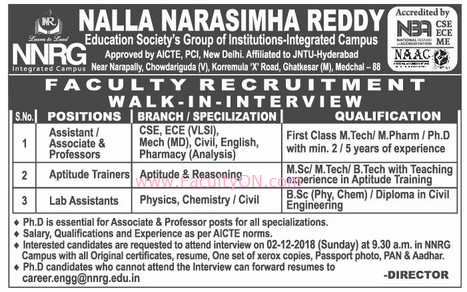 Nalla Narasimha Reddy Group of Institutions, Ranga Reddy has advertised in the EENADU newspaper for the recruitment of Professor / Associate Professor / Assistant Professor Plus Non-Faculty jobs vacancies. Interested and eligible job aspirants are requested to walk-in on 02nd December 2018. Check out further more details below. About College : This Society is established and registered with a primary objective of educating young men and women; to prepare them for fast changing national and international requirements; to fund the needy and promote research in the area of science and technology. Accordingly, an Integrated Contiguous Campus with multi disciplinary Technical, Engineering, Pharmacy and Management programs under the banner of Nalla Narasimha Reddy Education Society’s (NNRES) Group of Institutions is started. How to Apply: Interested and eligible candidates are requested to attend the Walk-in interview along with CV, all originals & one set of copies of certificates, PAN card, Aadhaar card and recent PP size photo to the walk-in address provided here.Those who can't able to come for interview, may send their resume through email address given below.